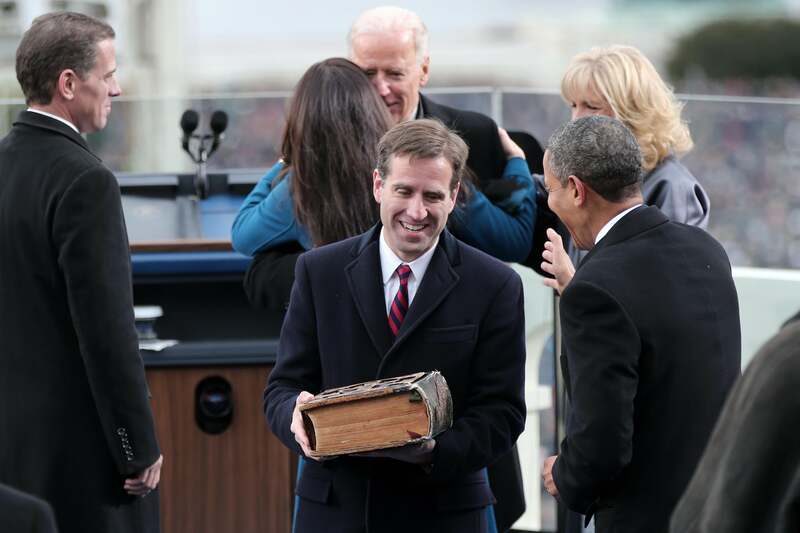 Beau Biden: Vice president's son, former Delaware attorney general has died from brain cancer at age 46. Beau Biden and President Barack Obama after Vice President Joe Biden is sworn in during the public ceremonial inauguration on Jan. 21, 2013. Beau Biden, son of Vice President Joe Biden, has died “after he battled brain cancer with the same integrity, courage and strength he demonstrated every day of his life,” the vice president’s office said in a statement. Beau Biden was 46. Beau Biden, a captain in the Delaware Army National Guard, served as Delaware’s attorney general for eight years, leaving the position in 2014 in anticipation of a run for the governor’s mansion in 2016. Beau had been a part of his father’s political career from the moment that Joe Biden was sworn into the Senate. The ceremony took place beside Beau’s hospital bed, where he was recovering from the 1972 car wreck that killed Beau’s mother and infant sister and injured his brother just weeks after Joe Biden’s electoral victory. In a 2012 Memorial Day speech to a gathering of the Tragedy Assistance Program for Survivors, a military support organization, Vice President Biden spoke about grief and his process of moving forward after the accident and the role of his sons in his relationship with his second wife. “In the words of the Biden Family: Beau Biden was, quite simply, the finest man any of us has ever known,” the statement from the vice president’s office concludes.